Fifty-four cows with left displacement of the abomasum (LDA) submitted to the hospital facility at Riverview Veterinary Clinic from February to July 2005 were treated by right flank laparotomy and omentopexy. Five cows died (a survival rate 90.7%) and one cow (1.8%) was culled due to recurrence of the LDA post-operatively. Forty-one cows (76%) returned to good production post-operatively. Thirty-nine cows (72%) were pregnant six months after corrective surgery. Left displacement of the abomasum (LDA) mainly affects high yielding lactating dairy cows during the first month postpartum , and was first described in the 1950s . Many techniques have been employed including: the left paralumbar abomasopexy or 'Utrecht' method ; the right paralumbar omentopexy or 'Hannover technique' ; the 'toggle pin' method (Sterner-Gymer, 1982); the ventral laparoscopic abomasopexy method ; and, more recently, the two-step laparoscopic-Janowitz technique . LDA surgery was initially performed the authors' veterinary clinic in the late 1970s (Kelleher, pers. comm.). In this paper, the current approach to surgical correction of LDA at this clinic is described. All LDA cases were diagnosed after hearing classical resonant sounds (i.e., 'pings') on simultaneous auscultation and percussion of the left flank, especially over the last three ribs during the clinical examination. Following diagnosis, surgery was performed within 24 hours. Surgery involved a right paralumbar laparotomy and omentopexy. The right paralumbar fossa area was surgically prepared. A 2% lidocaine solution (Norocaine; Norbrook Laboratories, Newry, Northern Ireland) was infused in an inverted 'L-shape' fashion. A 20 cm vertical skin incision was made at the centre of the sublumbar fossa, 10 cm caudal to the most posterior aspect of the last rib. The external oblique muscle was incised in a similar fashion. The internal oblique was incised bluntly along its fibres, whilst the transversalis muscle and peritoneum were incised vertically. The surgeon's hand was placed inside the abdominal cavity, lightly touching the peritoneal surface of the body wall. The abomasum was located by moving the hand down the right abdominal wall to the floor and up the other side, under the rumen. Previously, the trapped gas would have been released using a needle and rubber tubing reaching to the exterior; however, in the last few years the gas has been released by pushing the abomasum down to the midline and replacing it into its correct position on the right hand side of the abdomen. The pyloric sphincter region and proximal duodenum were exteriorised so that the omentum adjacent to the sphincter region ('Sow's ear') could be visualised. An area of omentum, 2 cm × 2 cm within 5 cm of the pyloric sphincter, was stitched in a continuous 'through and through' pattern, using a polyamide suture (USP 3&4/EP 6) and a round-bodied needle. The two ends of the polyamide were sutured through the peritoneum and transversalis muscle and tied with a simple suture midway between the abdominal incision and the final rib. The peritoneum/transversalis layer and both abdominal muscles were sutured separately using chromic catgut (USP 3/EP 7) in a simple continuous fashion. The skin was closed using the aforementioned polyamide in a continuous Ford interlocking pattern. Four cows in a shocked state were given hypertonic saline (5 ml/kg of 7.2% NaCL, 3l infusion for a 600 kg cow over five to six minutes) post-operatively. All cows were treated with penicillin and streptomycin (Pen-Strep; Norbrook Laboratories, Newry, Northern Ireland), propylene glycol (200 ml BID for the first day and 100 ml BID for three further days) and ruminal stimulants, 1 × 100 g BID (Stimulex; Biofac A/S, Denmark) for four days post-operatively. Any concurrent diseases were also treated. Metritis cases were treated with ceftiofur hydrochloride (Excenel RTU; Pfizer Animal Health, Ringaskiddy, Co. Cork) parenterally and intrauterine cephapirin (Metricure; Intervet, Boxmeer, the Netherlands). Mastitis cases were treated with trimethoprim sulphadiazine (Norodine 24%; Norbrook Laboratories, Newry, Northern Ireland). Cows were discharged either on the day of surgery or on the following day, with a recommendation of once-daily milking and hay feeding for three to four days, with a gradual reintroduction to concentrate ration and to the rest of the herd. On the day of diagnosis of LDA, details of each case were taken, including: length of time calved; lactation number; average annual yield of cow and herd; and, any concurrent diseases at or since calving. Several months later, clients were telephoned to determine whether cows survived post-surgery, how they had milked and whether they were going to continue in the herd. The majority of cases in this study occurred in March and April (Figure 1). 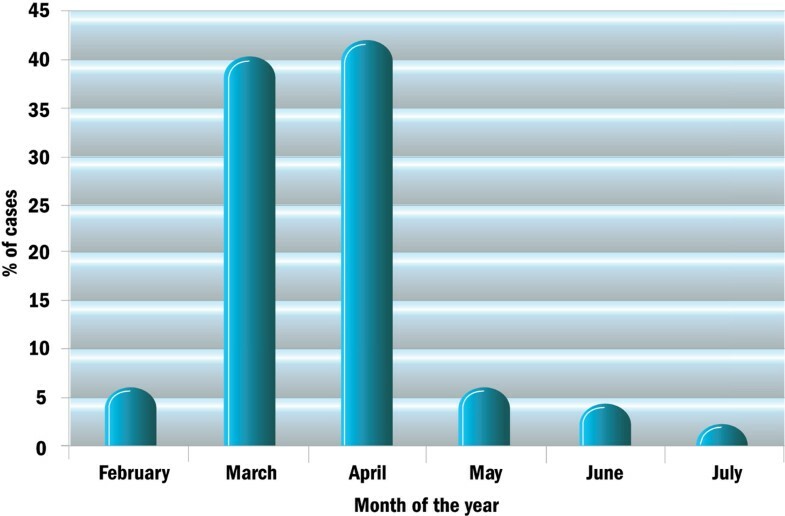 LDA cases (%) by month of the year. Ten cases (25%) of LDA occurred in each of the first three weeks postpartum (Table 1). The distribution of surgical cases by lactation number is shown in Table 2. The predicted 305-day milk yield for the surgery cases is shown in Table 3. 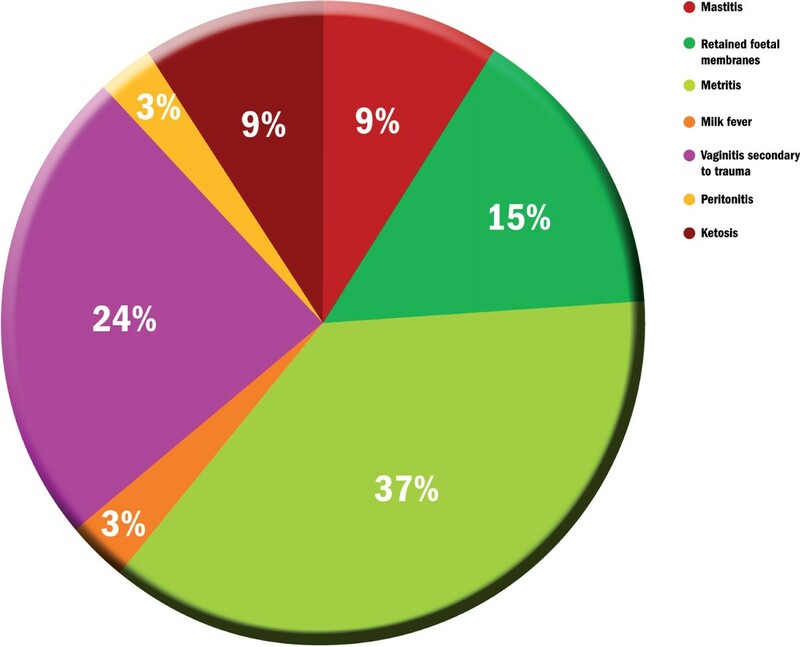 On clinical examination, concurrent disease was found in 33 of 54 cases (61.1%) of LDA (Figure 2). Three-quarters (76%) of all cases of concurrent disease were related to the reproductive tract, including retained foetal membranes (15%), metritis (37%) and vaginitis secondary to trauma following dystocia (24%). Concurrent disease in 33 cows with LDA. Two cows were inoperable and were euthanased because extensive adhesions throughout the abdominal cavity were found during surgery. Three cows died following surgical intervention (Table 4). One cow died as a consequence of fibrinous peritonitis diagnosed at surgery. However, two cows died unexpectedly after routine surgery; one cow had early fibrinous peritonitis at necropsy. The survival rate was 100% from one week post-operatively. Forty-one of the 49 cows (83.7%) were still milking four to five months later and 39 (79.6%) were pregnant. The prevalence of LDA on high-producing dairy farms varies from 0-7% per annum  with an increasing incidence due to rising average milk yields , higher genetic merit cows, inadequate nutritional management of high yielding cows and increasing awareness amongst farmers and veterinary surgeons. The temporal occurrence of LDA, with a peak in the months of March and April in our study, coincides with the early postpartum period and peak springtime calving. An important finding of this study was that 75% of LDA cases occurred within the first three weeks postpartum. This occurrence is higher than some American studies which show only a 65% occurrence by 50 days postpartum . However, in other studies, 80% of cases occurred within 30 days of calving [18, 13]) and 57% in the first two weeks, 80% in the first month and 91% by six weeks . It is possible that many of the cases of LDA in our study that were diagnosed during the third week postpartum could have been present earlier because the case history obtained from the client reported that the cow "had not been right" since parturition. In addition the peak in LDA occurrence associated with high milk yielding cows (≥9,000 litres) may be explained by the increased metabolic stress on these individuals. The peak at the 5,900 litre average milk yield may be explained by the fact that the majority of animals included in this study were young cows in their first and second lactations. These young cows naturally milk less than older cows and thus their expected average milk yield would be lower. Our finding of 32.5% of LDA cases in primiparous animals contrasts with American research [18, 13] that reported that first-calvers had an incidence of only 18.9%, second lactation an incidence of 21.7% and third lactation an incidence of 59.4%. Fubini and Ducharme  reported that LDA was most common in cows between four and seven years of age. The present study finding that 61.1% of LDA cases had concurrent illness is supported by other studies whereby cows with LDA were twice as likely to have another ailment as those that did not . The pathogenesis of LDA involves three factors: rumen fill; post-partum abdominal void; and, abomasal atony . For left abomasal displacement, space in the abdominal cavity must be created. This naturally occurs postpartum with the delivery of the calf, expulsion of the placenta and subsequent involution of the uterus. Holstein cows may be particularly predisposed to LDA due to the larger abdominal cavity . This increase in abdominal space is exacerbated when the rumen is small, thus leaving space for the abomasum to displace to the left side . Poor rumen fill in its own right is also a major contributory factor . Reduced appetite after calving directly leads to reduced rumen fill and size. Also, these animals may not have access to adequate quantities of long fibre, resulting in reduced rumen function and appetite suppression. Cows that are fed finely ground rations  or an excess of short fibre forages such as maize  are more likely to develop an LDA due to reduced rumen fill and increased fermentation. The final contributory influence is abomasal atony . Endotoxins and mediators of inflammation (e.g., histamine) released after metritis, mastitis and laminitis can lead to a reduction in abomasal motility . Such a hypomotile abomasum filled with gas due to excess volatile fatty acid (VFA) production displaces from its normal position to the dorso-cranial aspect of the left abdominal cavity. In this study, two cases were inoperable as there were extensive adhesions throughout the abdominal cavity making reduction and relocation of the abomasum impossible. On consultation with the owner, both cows were euthanased. One cow died post-operatively due to the presence of a fibrinous peritonitis that appeared to be well advanced. Although the position of the abomasum was corrected and the cow was treated accordingly, the prognosis remained extremely guarded. No abomasal ulcer was detected and no other obvious aetiology was observed. This represented a rate of 1.9%, compared with a rate of 1.5% achieved in a 400-case study by Verhoef . In the present study, two of 54 cows (3.8%) died unexpectedly. Postmortem examination of one of the cows, two days post-surgery, displayed changes in peritoneal fluid and a presumptive diagnosis of peritonitis was made; no abomasal ulcer was present. This mortality rate compares with a rate of 7% in the study by Kelton et al. which compared the paramedian approach with the toggle pin technique. Single deaths were recorded from mesenteric volvulus, salmonellosis, metabolic disease and suspected pyloric stenosis . One case of LDA treated in the current study recurred (1.8%). This may have been associated with the tearing of the polyamide suture through the fat in the omentum. This recurrence compares to 0.25% in Verhoef's two-step laparoscopic-Janowitz technique (2005). An earlier study into the rolling method found re-occurrence rates of up to 50-70% . A recurrence rate of 1.4% was reported for both the paramedian and toggle-pin techniques . A 3.3% recurrence rate was reported for laparoscopic-guided abomasopexy . Seventy-six percent of cows were milking satisfactorily six months later, while 79% of cows that were bred were back in calf. This compares favourably with the left paralumbar omentopexy study  but less so with the smaller study for a ventral laparoscopic abomasopexy method in a group of 17 cows , with rates of 100% and 88%, respectively. A decision-tree analysis study of treatment alternatives for LDA carried out in the USA , suggests that surgical treatment had the highest expected monetary value (EMV) of $1,661. Closed surgical techniques, e.g., 'roll and tack', had an EMV of $1,636, whilst rolling had the lowest EMV at $764. This, however, was greater than the EMV of $480 obtained by selling the animal. This present study highlights the potential benefits of surgical correction of LDA in a practice setting. The authors would like to thank: colleagues and staff at Riverview Veterinary Clinic for all their help and assistance; students Elena Nani, Torino, Lisa Ebner, Ingolstadt and Christiane Freytag, Leipzig; and the kind staff at the veterinary library, UCD.